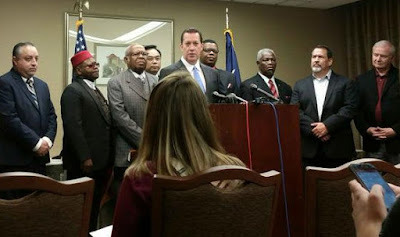 A group of pastors fighting Houston's equal rights ordinance has filed a lawsuit against Mayor Annise Parker, claiming she tried to deny voters' rights and intimidate clergymen opposing her. The legal action comes at the beginning of what's likely to be a passionate campaign leading up to a referendum on the ordinance in November. "She violated and trampled the voting rights of over a million people in the fourth largest city in the United States of America," said Andy Taylor, the attorney representing the clergymen, at a news conference with his clients. "Are you with me? Can you believe it? Is that what happened?" The clergymen who filed the suit have fought the ordinance from the beginning, focusing on its protections for gay and transgendered people. They're among the leaders of a petition drive that called for a referendum to repeal the ordinance. Last month the Texas Supreme Court ruled that Houston must either repeal its LGBT rights ordinance or place it to a public vote. Parker has vowed to win at the polls. RELATED: Next month the above-pictured pastors will take part in an anti-gay forum titled The Texas Response.